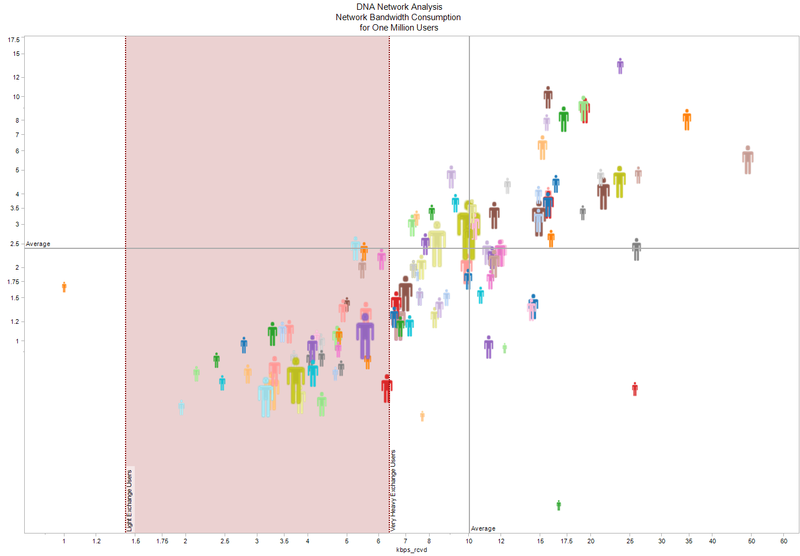 aukema.org: Network Sizing: Assumptions or Well Informed Decisions? Network Sizing: Assumptions or Well Informed Decisions? In an earlier post, I mentioned I would do some more work on the Exchange Client Bandwidth Calculator from Microsoft. I will try and explain why I strongly disagree with these kinds of tools. 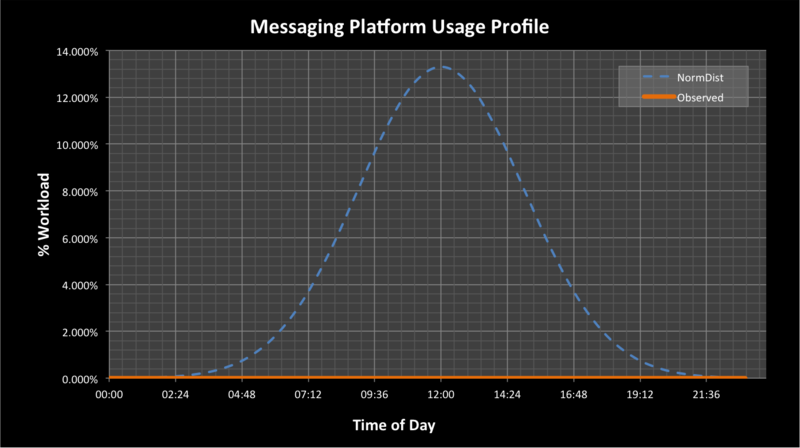 Each Domino server logs the activity performed by end users. For each user session, an entry is written in the log that records start and stop time (and duration) of the session along with the network bytes sent and received by the client from the server. There's more data logged, but this is not relevant for this article. 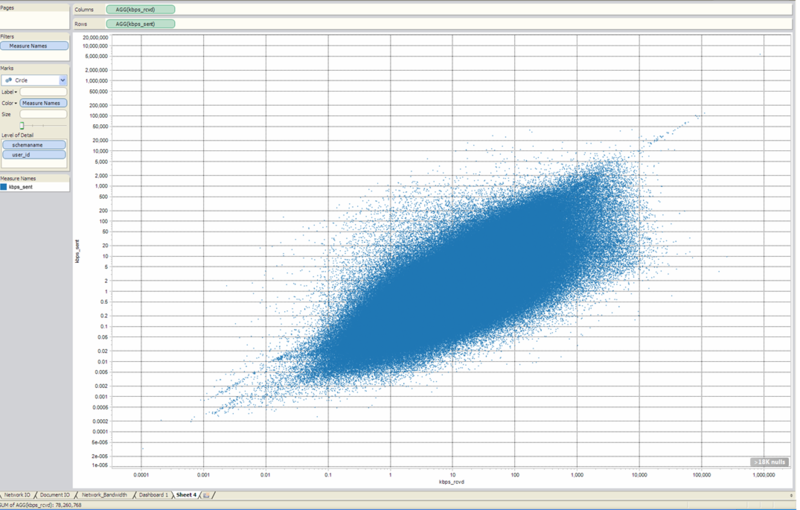 Both axes are scaled logarithmically for visualization purposes, and the overall DNA average is shown by the cross-hair. 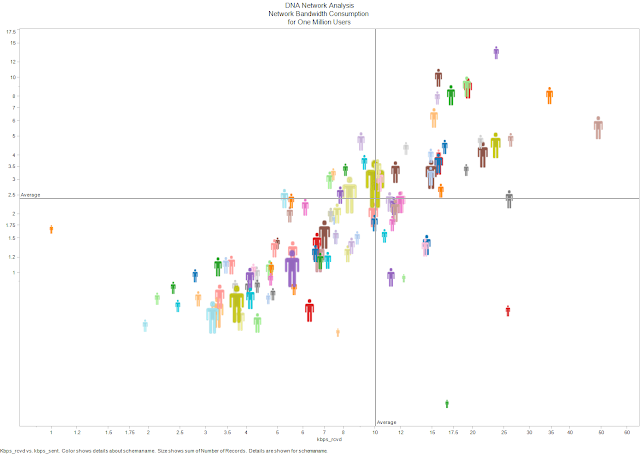 Each icon in the graph represents a customer organization, the larger the icon, the more users the organization has (seat counts range from 10 to 93,000). What's causing the huge differences? 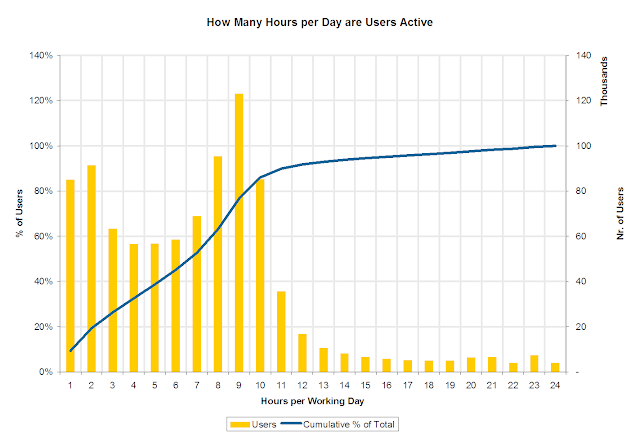 Analyzing the distinct number of hours that users are active for my 100 recent customers, shows that 20% of all users are active less than two hours per day (blue line). 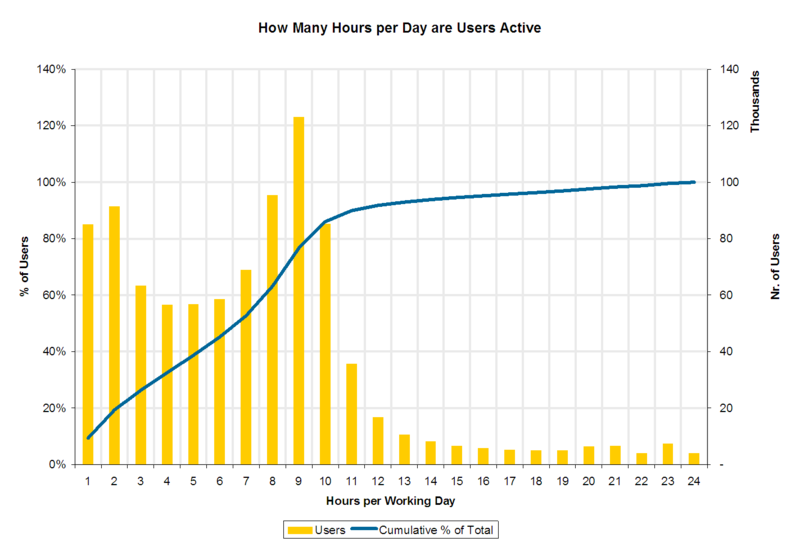 40% of all users are active no more than 5 hours per day. 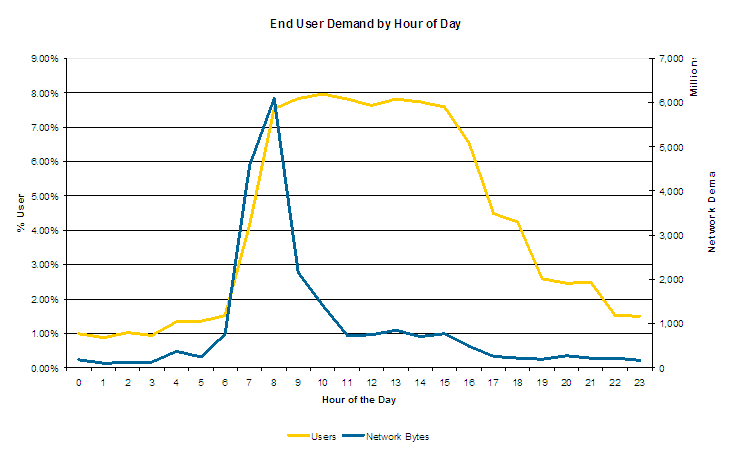 Notice how most users are online between 7 and 17, but the network load is very much concentrated around the morning hours. 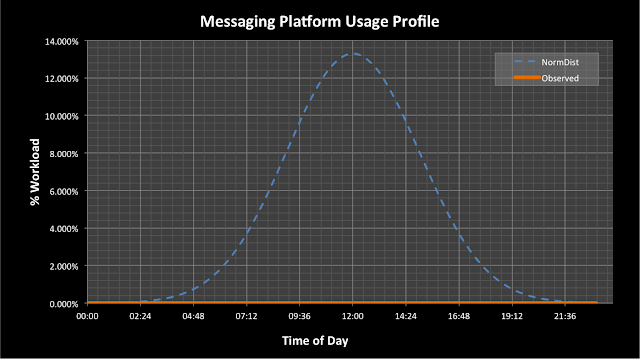 This is when the remote workers (that are typically online 1-3 hours per day) consume all their new mail, especially on Monday morning. Having experience with large customers, Microsoft should realize that users can be located in different time zones. So unless you place a data center in each time zone, and have all users from that time zone connect only to that data center in their on time zone, you will see demand patterns that do not match a normal distribution. Instead you will see multiple distributions come together in one data center. Dear Microsoft, please beware that the real distribution for network bandwidth consumption of end users lays as much as 8 decades (10^8) apart. Each customer is a unique. Even within each customer you should analyze the Real End User Demand in each office location, before calculating network requirements.